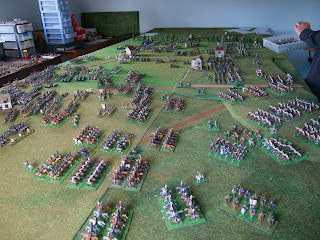 We completed the second part of our bicentennial game of Lützen on Saturday. What a fine game it was, especially for the Allies, ending in the early hours of Sunday with a ‘crushing victory’ to the Russo-Prussians! Julian (Blücher) and Mark (Wittgenstein) did what their historical counterparts should have done, attacking determinedly, aggressively and in a co-ordinated fashion. Having pushed back Souham’s division from Gross Görschen in the first ‘half’ of the game (see report elsewhere on this blog), they drove hard for the ‘northern’ table edge to face off the on-coming French-Allied reinforcements. The newly arrived divisions of Ney’s corps (Ricard, Brenier, Marchand and Laboissière’s small cavalry brigade) remained isolated to the east of Kaja and, while they did well against the Prussian brigades of von Klüx and von Pirch I, faced increasing numbers of allied troops in the form of the Russian Imperial Guard, no less. 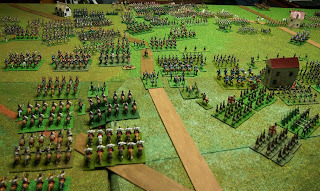 Napoleon with Marmont’s corps (followed by the Guard off-board) hemmed into a limited deployment around Starsiedel. View looking roughly north with Dolff's Prussian cavalry supported by the Russian reserve cavalry of Trubetzkoy in the foreground. Yet more Russian cavalry are being deployed on-table, Gallitzin V's cuirassier corps, in the right centre (note hand of god). The allied coup de gras though, was to hem Marmont’s corps and the Guard into a limited deployment around Starsiedel. View from the across Monarch's Hill with allied troops as far as the eye can see! 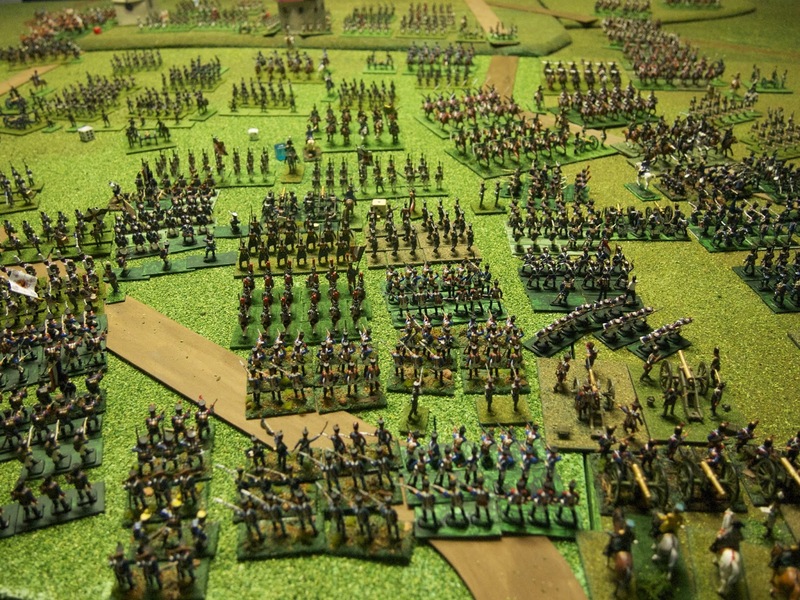 From the opposite side of the table, north of Starsiedel, with Young Guard in centre foreground, Friederich's division of Marmont's corps to their left, opposed to von Berg's Russians and von Röder's Prussians respectively. Massed troops around Starsiedel. 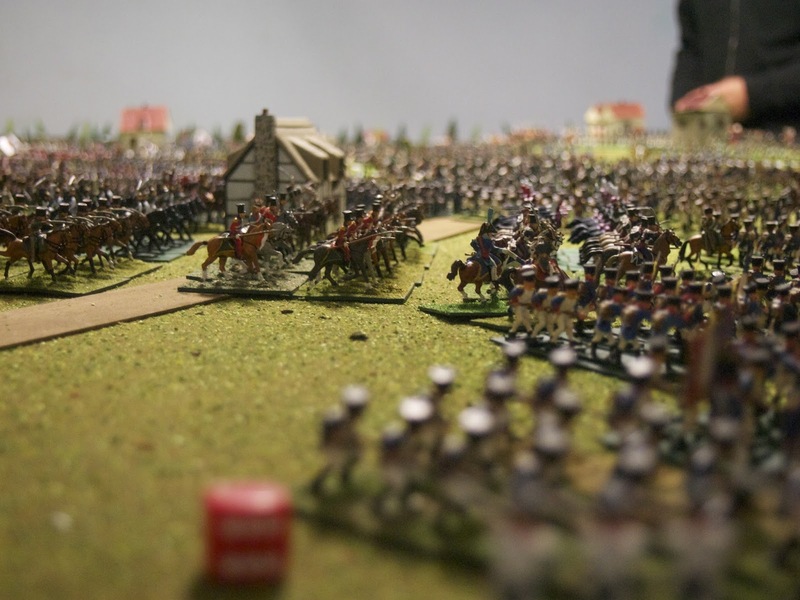 Bertrand's in the foreground (out of focus), then Guard cavalry in centre of picture. 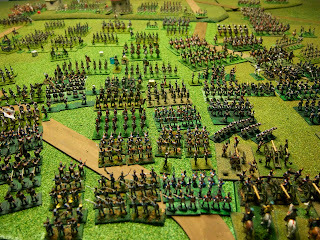 A little further east from the previous photo, showing Girard's division facing off Dolff's and Trubetzkoy's cavalry. At the 'eastern' end of the table and on the other side of the Floßgraben, Eugène of Wurttemburg's II Russian Corps defend against MacDonald's flank attack. Game’s end, at 19:00 on 2nd May (i.e. after the 18:30 turn), found the Russo-Prussians in control of all towns of the quadrilateral (Gross Görschen, Klein Görschen, Rahna and Kaja) and having inflicted roughly 2:1 “losses”. The French-Allied divisions of Marmont’s corps and the Young Guard, supported by newly arrived divisions of Bertrand’s IV Corps, were beginning to make inroads into the Allied ‘corral’ presented by von Röder (lead by the Prussian foot guard), von Berg and the masses of Russo-Prussian cavalry, with von Yorck in suppor, but the armies were well and truly intact##. 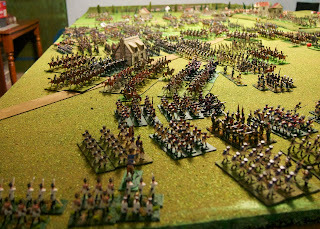 At game's end the masses of French reinforcements at the 'western' end of the table have made only modest gains against the Russo-Prussian 'corral'. 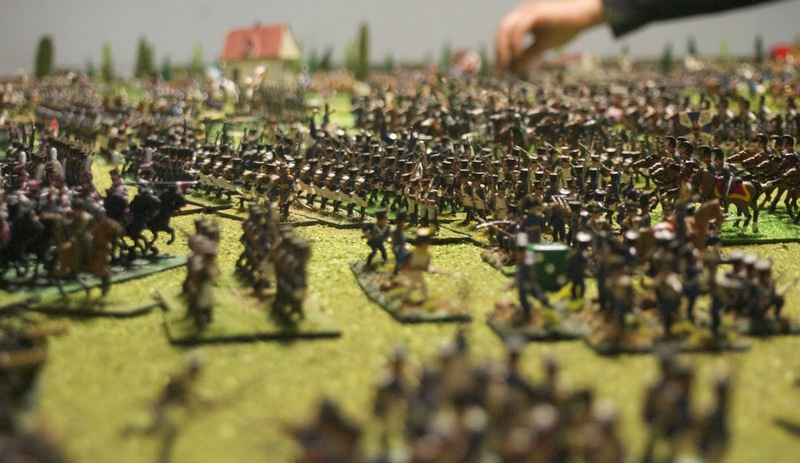 The Russo-Prussians received a total of 337 points. 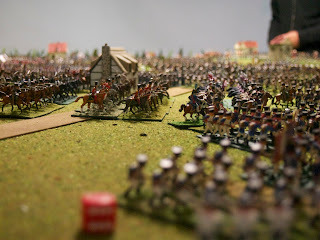 Controlling the four towns gave them 240 points and breaking the divisions of Souham and Brenier plus Laboissière’s cavalry brigade gave them 97 points (divisional MRs of 52, 36 and 9). 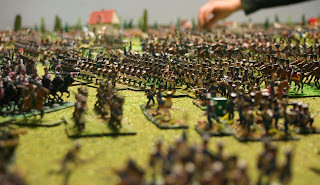 The French-Allied side received 34 points for breaking von Klüx’s Prussian brigade. That’s a difference of 303, giving a Russo-Prussian ‘crushing victory’ in the scenario. The full pictorial report is a little way off, so the photos above have to serve to whet your appetite. Next in our schedule of bicentennial games is Bautzen, which we plan to begin in September. 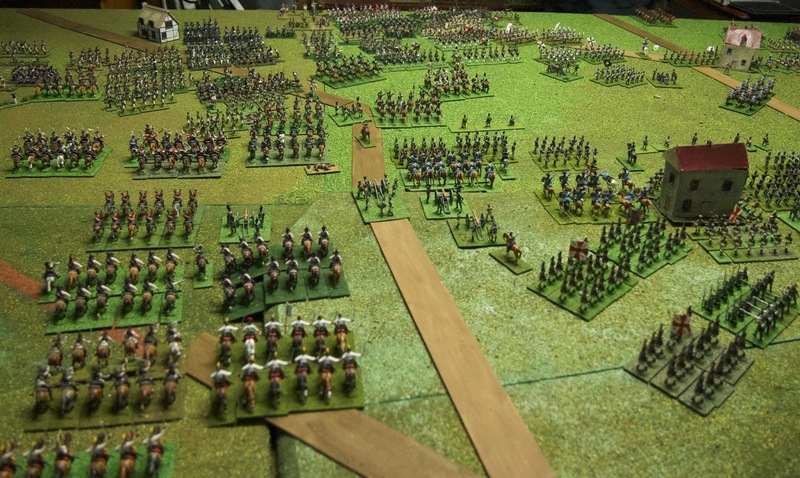 ## As there’s still a lot of fight left in both armies at the end of this game, and since all the figures are still set up, we are going to play out a fictitious second day of Lutzen in August as a separate, stand-along scenario game. Should be a(nother) cracker. WOW! That's a lot of troops on the table. Looking forward to the fictitious 2nd day! I am expecting our hypothetical Day 2 of Lutzen to be a heavy, slogging and tight fight. 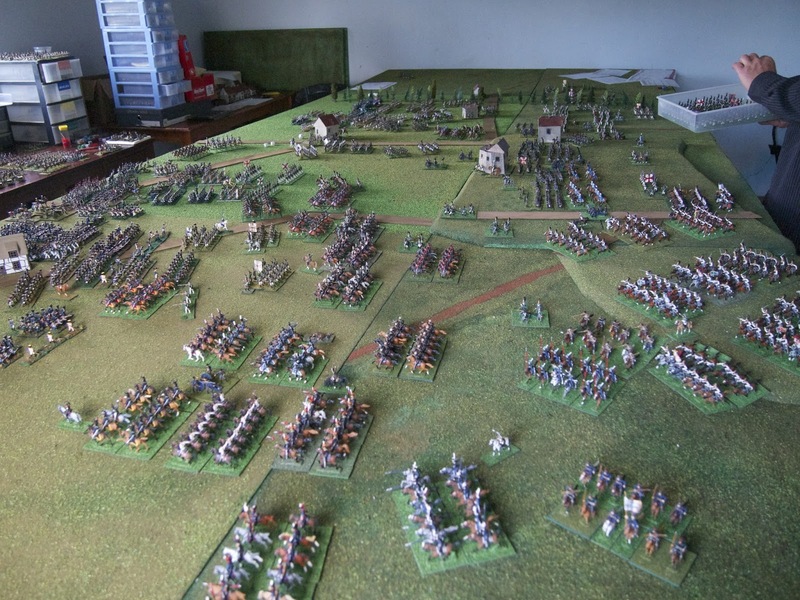 The preponderance of Russian and Prussian cavalry makes up for their fewer troops, so it's a pretty "fair fight". Very impressive, the mass of troups is awesome! 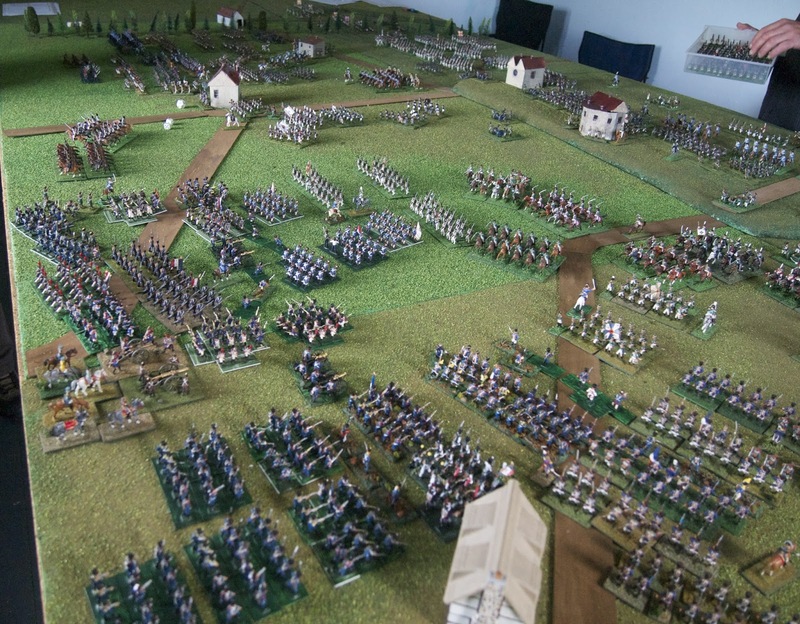 The 1813 campaign in Germany is all about big numbers isn't it? I have a book called "Warfare in the Age of Bonaparte"—it is one of those general military history books and part of a series. The chapter about the 1813 campaign is entitled "The Big Battalions", which is always seemed appropriate to me. You must have had a seriously big table for that many figures. Thanks John. Yes, we are fortunate to have a 4.8 m x 2 m table to use. We need to add 1.6 m of width for when we do Leipzig though. After consideration of options and feedback from our wargaming e-friends we are working on four 0.8 x 2.4 tables on rollers. That's not going to be until late next year though...! As the troops are currently positioned close to one another there is a need for a clear rule about how the night's disengagement will work.James will be posting soon (!) his excellent rule for how we handled this type of situation before, at Fuentes de Onoro in 2011. Perhaps I'll add it to the full pictorial summary of this game. Not that it is particularly clever or amazing (or even original, I suspect...)!